Now that the old year is on the wane, it’s a good time to evaluate how we did in 2011 as we look forward to 2012. Evaluate how much supplies you have stored up. How much water and food have you managed to store so far? For us, due to space issues, we have about a couple week’s worth of water, and about eight weeks worth of food, including the refrigerator and pantry. I know we have a ways to go in terms of water, but that is now our starting point for the coming year. How much equipment do you have? We do have a couple of ways to purify water, with the Big Berkey filter for bugging in as well as the Lifesaver bottles in case we have to leave. We also have plenty of batteries, matches, flashlights, camping stove and lanterns as well as solar chargers in case the power gets interrupted. Consider the skills you’ve picked up. At Apartment Prepper, so far we’ve learned how to make bread from scratch, brew coffee without electricity and make home made yogurt. We learned how to cook freeze dried food. We also featured basic recipes for plain white rice, and making a pot of beans. The balcony garden did not do so well this year due to the drought, but we are ready to start is up again this coming year. De-clutter and make more space for your supplies. We are constantly trying to find space for survival supplies, so we have to keep re-evaluating our space. The end of the year is a good time to clean up. You will also want to check if any pests are around your storage areas. We are pretty vigilant about keeping pests out but notice they try to come in from the outside. In apartment buildings, whenever someone moves in or out we notice a few extra pests trying to come in. Examine your canned food expiration dates-you don’t want this food storage disaster to happen to you! Evaluate your home security. Being in the big city, we are always conscious of security issues. Make your doors and windows more secure and consider other alternatives for home security. Evaluate items you carry daily and consider personal security items as well. The above is not a complete list, but should hopefully get you thinking about your own preparedness and survival activities. Don’t beat yourself up if you fall short of your own expectations; instead, give yourself a pat on the back on how much you have accomplished! Likely, you are already ahead of 70% of the population. You know that ‘voice’ in the back of your head? You should listen to it… In other words, you should trust your instinct, your internal knowledge, your feeling, your sense, your intuition. Humans know the power of a nagging suspicion. Believe your inner feelings when you get uncomfortable about a person or situation. Recognizing, trusting, and acting upon your internal voice is a form of self-communication that will keep you ahead of the pack while making better and quicker decisions than the rest. While some decisions are better made with a long analysis and thought process, there are many that are better made with quick thinking and reaction. A UCL (University College London) study found that you are more likely to perform well if you do not think too hard and instead trust your instincts. The research shows that in some cases, instinctive snap decisions are more reliable than decisions taken using higher-level cognitive processes. A study in the Journal of Consumer Research concluded that people who deliberate about decisions make less accurate judgments than people who trust their instincts. In five separate studies, the researchers found that better judgments can often be made without deliberation. 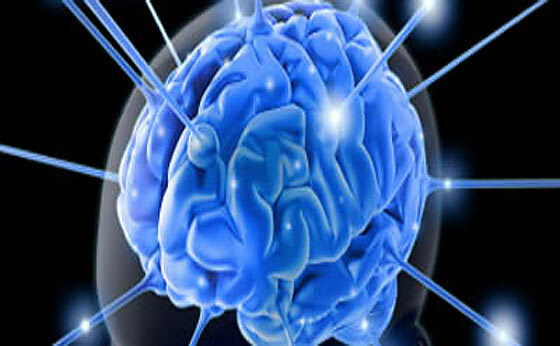 As you gain more life experience, you build up a reservoir of subconscious subliminal instincts. When called upon, more often than not, your instincts will be right – or close to right. A problem that many people have is that they do not listen to that voice. Some have issues with their confidence, and they allow their instincts to be clouded with doubt. When it comes to survival preparedness, making the right decision is key. Your decision response time could make the difference between success and failure – being first or being last – getting out of a dangerous situation or being caught in the middle of it with everyone else. Next time you have to step off into the unknown, tune into the voice of your intuition. It speaks to you from the purest place, knows the truth of who you are and can lead you to the answer that’s right for you. Smoke detectors expire. Yes, after about a decade their sensors lose sensitivity. The U.S. Fire Administration says most alarms installed today have a life span of about 8-10 years. After this time, the entire unit should be replaced. It is a good idea to write the date of purchase with a marker on the inside of your alarm so you will know when to replace it. Some of the newer alarms already have the purchase date written inside. In any event, always follow the manufacturer’s instructions for replacement. Many people change their smoke detector batteries during the New Year (an easy way to remember), so this year while you think about it, it may be a good idea to figure out how old your detectors are, and replace them if they are approaching 8 to 10 years. Ever wondered how a smoke detector works? A typical ‘optical’ smoke detector uses an infrared LED beam of light that shines through a lens that will collimate the beam (make it parallel and bring it in line) which then projects in front of, and past, a photoelectric sensor (without hitting it). When smoke enters the collimated beam of light, some of it will scatter and direct some of the light at the sensor, which in turn triggers the alarm. Jessica from Holland sent us a letter recently praising our work, but very, very gently scolding us not including the hay box, a groovy old energy saving technology, in our book. We do stand corrected! And her enthusiasm for hay boxes has reignited our interest, too. We actually considered hay boxes for Making It, but didn't end up building one for a variety of reasons, including just plain running out of time. But I have to admit one of the primary reasons was that natural gas here is really inexpensive, so the cost savings of starting and finishing a pot of soup on the stove, vs. starting a pot of soup on the stove and finishing it in a box, just wasn't compelling enough for me to make a lifestyle change. This is a silly excuse--water is also inexpensive here, but I'm obsessed about saving that resource. I guess a lot of what we choose to do just comes down to our various quirks and passions. I'm thankful to Jessica for reminding me of the hay box. I believe that my New Year's resolution will be to meditate on the sources and real costs (in terms of the environment, human health, etc.) of gas and electricity, and work on new ways to conserve energy. The hay box, or fireless cooker, may be one of these strategies. What the heck is a hay box? Sorry if I'm leaving some of you out of the loop. A hay box aka fireless cooker is a very old fuel saving technology, which perhaps has its origins in Scandinavia. It is simply an insulated box that you put a hot pot of food into, and leave it all day (or all night) to finish cooking. It's the forerunner of the crockpot. This cooking technique isn't limited to hay boxes. The same concept is used by people who put oats and boiling water into a Thermos at bedtime and enjoy the finished oatmeal in the morning, or by campers who wrap their sleeping bags around a cooking pot so they'll have hot food when they get back to camp. As far as I can tell, no one is selling fireless cookers made in the old style, but they are quite easily fabricated at home--or improvised in emergencies. However, if you are in a buying mood, a very similar technology exists in something called thermal cookware. These are essentially giant Thermoses--I'm including a link to a random example of one on Amazon here. Why would you want to build a fireless cooker? To save energy, because you're a do-gooder. To save energy, because energy is expensive/unreliable where you live. Okay, so how do you build one? It's really simple. You're just insulating a pot. There are many ways to do it, including simply bundling the pot up in a bunch of quilts. But if you're going to do this regularly, you probably want a more stable system than that. You'll want to build a box. First, though, you should probably start with your pot and build from there. This technique works best when the pot is full, so you'll want to choose a soup pot/dutch oven sort of pot that is the right size for you and your family. It should have a lid, obviously, and should be made of something can come and go off the stove top--i.e. no ceramic. Once you've chosen your pot, you'll need a box to keep it in. This box should allow enough space for at least 4" of insulation all around your pot. (We'll talk about the insulation next.) So the pot height/pot width plus at least 8"= the minimum dimensions of your box. The cooker could be anything sturdy with a lid, but the tighter built, the better. A big cooler would work great. I've just had a crazy inspiration that one of those newfangled ottomans that are hollow inside for stashing away your junk when company comes would also work nicely! You can make a "two holer" if you want to have the ability to cook more than one dish at a time. In that case you might be able to build one in a hall bench or a big toy chest or trunk. If you can't scavenge anything, you could build a wooden box with a hinged lid. A well-insulated, box-style solar oven can do double duty as a fireless cooker, too. Whatever you choose, the box should have a lid that either latches or can be weighed down so it closes securely. If your box is not built pretty much airtight--say it's pieced together out of wood--you should seal it up before you insulate it. In old manuals they recommend gluing a layer of paper all over the interior. You might choose to use tin foil or a Mylar space blanket. A space blanket would help reflect heat no matter what your box is made of. Then you need to choose an insulating material. Styrofoam or foam. Carving a pot-shaped hole into a block that fit your chest would be the best, but scraps could work, too. Shredded paper. At last, something to do with all those bills! Cotton or polyester batting taken from old pillows or quilts. Wool in the form of cast off sweaters and blankets, perhaps shredded? This might sound nuts, but if you cut down a bunch of weeds, let them dry and chop them up, they would work as well as hay. Straw has that nice hollow stem construction which probably holds heat better than hay, but some weeds have the same sort of stems. Note: I'd discourage using fiberglass insulation for safety reasons. It's nasty to work with and you don't want to risk any of it getting in your food. Fill the box up all the way with insulation. 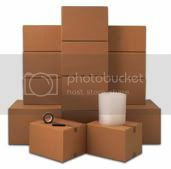 The box should be filled to the top, but the material shouldn't be packed so tightly that there's no airspace. Tiny air pockets are where the magic happens. Next, make a permanent nest for your pot in the box by hollowing out a pot-shaped hole in the insulation material. Line that hole, as well as the top surface of the insulation, with a one big piece of fabric. Secure that fabric to around the edges of the box with staples or something. That will allow you to lift the pot in and out easily and will also keep bits of insulation out of your food. The final insulation step is to make or find a cushion sized to fill all the empty space in the box from the top of your pot to the closed lid. It should be fat enough that you have to use a little pressure to close the lid. There should be no open space at the top of the box. And again, the lid must latch or otherwise secure tightly. In the image at the top you can see the two cushions that come with that set up. It's often easier to understand something just by looking at pictures. If you do an image search for hay box, you'll see lots of them, many improvised quickly. Whereas searching fireless cooker brings up more antique images. A fireless cooker from a 19th century German catalog, image courtesy Wikimedia. Okay, this is all very theoretical for me because I haven't done it yet, but this is what I know, and I hope those with experience will comment to help us newbies out. The cooker is perfect for anything you'd associate with a crockpot, like pot roasts and other stewed meats, soups and stews and chile, bean dishes and also hot cereals, polenta, whole grains and rice. First, it's pretty much impossible to offer up exact cooking times. 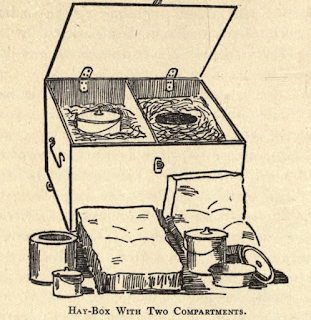 It's going to vary by both quantity of food and the construction of your box. In short, you're going to have to play with it. But the gist of it is that you start your cooking on the stove. If, for instance, you're doing an initial saute, you'd do that first, then you'd add all your ingredients and liquids and bring it up to a simmer (for how long may vary by recipe--the old cook book I'm consulting most often recommends 10 minutes boiling on the stove for meaty dishes, but if I suspect for non-meat things you could just bring it to a boil and then take it off immediately) then move it to the box to finish cooking. A good box should hold heat for 8 hours. The actual cook time will be less--how much less will vary by dish. But it will not burn or overcook and it will keep warm until you're ready to eat. I've heard that in general you would use less water than with stove top cooking because there's no evaporation. Suggestion: put the beans/lentils/wheat/rice/peas in a thermos flask together with the absorbable amount of boiling water/stock. Do this in the morning. In the evening you have a thermos with still warm and well-cooked food. With just a few seconds of boiling water. Think of the hours per month that you can turn off the stove and still have warm, cooked food! Eggs: put pan with eggs and boiling water in, take out of hay chest after 10 minutes (or more, or less, depending on your experience. Vegetables: take out of hay chest after 110 to 125% of ordinary cooking time. Experiment! Don't use a lot of water. Mr. Google can lead you to various resources on this technology, but my favorite resource so far is this old book: The Fireless Cook Book by Margaret Mitchell (1909), which is actually both a construction manual and a cookbook--a wonderful crusty old cookbook with recipes for things like Mock Turtle Soup. You can read it online at Archive.org, or download a pdf or even as an e-reader file--for free! Do you have any recipes, tips or techniques to share? Please do! An obligatory nanny-state warning: If food drops below 140F (60C) for an hour or more, bad bacteria can move in. You might want to take the temperature of your food when you pull it out of the box and see where it is. If it has dropped below that temperature, put it on the stove and rewarm it to at least 165F(74C). Several months ago, my friend Em (name has been changed to protect the not so innocent) and I recently got to talking about stocking up on food and she told me she was pretty confident she had enough food stored up. Em has one of those large walk-in pantries that can be filled from floor to ceiling, something alien to us apartment preppers. She is quite preparedness-minded herself; she’d been carrying around a full suitcase of backup clothes for the kids in the trunk of her car long before I even thought about emergency prepping. When she told me she wasn’t worried about food storage as she had more than enough, I could tell she did not want to get into too much detail so we left it at that. She and her DH had to don a pair of gloves, some masks and some old clothes (practically a haz mat suit). They emptied the entire pantry, and swabbed it down with bleach solution. Turns out they had cans of food from 2002 that they had forgotten about. The cans got so old that they exploded, which means botulism toxins could have gotten all over the place. 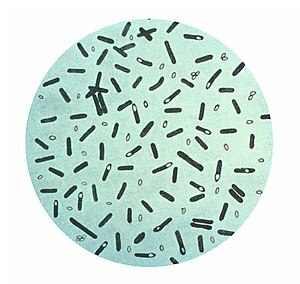 Well Botox may be something some people may want in their face, but botulism bacteria (or Clostridium botulinum) is quite dangerous around food. Symptoms generally appear between 18-36 hours of eating a contaminated food, or possibly as early as six hours and up to 10 days of eating a contaminated food. Infants can catch it from eating honey or corn syrup as their digestive tracts are not fully developed to handle these foods. Back to my friend Em’s story. They threw out everything in that pantry. As they went through the cans, they wondered why they had stored stuff that no one in their family eats. Some cans were already getting puffy, but even the newer cans got thrown out. If any of the toxic liquid got even close, they went ahead and threw them out in double bagged construction bags. It wasn’t worth the risk of botulism. Em is actually glad she realized their mistakes before an actual emergency. Had an emergency happened, they would have had nothing to eat. They realized their food storage was so out of date they needed to restock as soon as possible. They immediately went ahead and carefully shopped for foods they would normally eat, as well as basic ingredients such as rice, beans, pasta, sugar, oatmeal and other bulk foods that they can self seal in food grade buckets for long term food storage. This time Em is making sure they rotate their stocks. I told her I could not pass up the retelling of this story I’d have to blog about it. She figured if it helps someone else, then she doesn’t mind at all. Hoarding is the excessive and often compulsive collection of items, along with the inability to discard them. Hoarding often creates such cramped living conditions that homes may be filled to capacity, with only narrow pathways winding through stacks of clutter. Prepping is the acquisition of supplies stored for rotation of present and future use, and is an insurance policy of sorts for maintaining a standard of living during a disruptive or disastrous period of time. A hoarder is hoarding because they are compulsive and cannot stop or discipline themselves to stop. They often will hoard one type of thing or another without any real thought of practicality or the benefit of having that stuff. A prepper is building supplies with a practical purpose. I suppose that a non-prepper may consider a prepper to be a hoarder if they walk into their house and see extra stuff in plain sight. Because it seems out of the ordinary, they may presume the prepper to be a hoarder. In reality though, if you look at a prepper’s stuff, it will usually make sense – extra food stores and somewhat normal supplies. A hoarders stuff will often appear cluttered and irrelevant to everyday use or preparedness. If you are a prepper and do not wish to be labeled a hoarder, a good solution is to neatly organize your supplies in various places around the home. Even better is out-of-sight. If your friend or neighbor happens to open a well stocked closet or pantry, it won’t look so out of place if things are organized. Organization will help you ‘know’ what you have anyway… it’s a good idea. What Kind of Person is a Prepper? The power is out and there’s no indication that it’ll be back on anytime soon. The storm that blew through your slice of creation has left a wide swath of destruction in it’s path. The local utility crews are working as fast as they can, but it looks like you’ll be roughing it for several days, perhaps a week. Fortunately you are prepared for just such an occasion as this. You have some food put away, and not just the perishables that everyone ran out to get during the 11th hour before the storm hit. No, you have a pantry full of canned good, boxes of rice and flour, and even some water. You are prepared. Feels good, doesn’t it? After you finish your first hot meal after the storm, you realize that you have dishes to do. Pots and pans that were used to prepare your meal are dirty. Forks and knives, plates and glasses, all must be washed and sanitized. But the dishwasher is out. And the electric hot water heater is of no use to you now. How can you clean your dishes? No problem; use the trusty three pan method of washing dishes and they’ll be every bit as clean as if they’d gone through your automatic dishwasher. The three dishpan method of washing dishes has been around for many years. It’s still a mainstay in the Boy Scouts who frequently use this method during overnight camping trips. As you may expect, the three dishpan method uses three dishpans. We have 18-quart plastic dishpans for this purpose. They are 18″L x 15″W x 7″H. Most anything large enough to hold water and submerge plates and pans in will work. In a pinch, we’ve used 5-gallon buckets. The first dishpan is for washing the dishes. Heat some hot water over the same heat source that you used for cooking your food. Heat quite a bit since you’ll need to fill the first tub approximately 1/2 full with hot water. You’ll also need some hot water for the second tub as well; more on that later. The water in the first tub should be pretty warm, not lukewarm, but not scalding either. There’s not need to scald your hands, but cleaning is easier and better with warm to hot water. Add a little dish soap to the water. You don’t need a lot of dish soap; just a small squirt will do. There is no need to have it look like a bubble bath. We only need enough soap to help the water bind with any grease left on the dishes. The second pan is our rinsing station. It should be filled approximately 1/2 full of hot water. It doesn’t have to be scalding hot, but it should be very more than just warm. Do not add soap to this pan. It’s only purpose is to remove soapy water from the dishes. Fill the final pan 1/2 way full of water. The temperature of the water in this pan is not terribly important. If it’s summertime, I’ll use ambient temperature water. In the wintertime when my hand are cold, I typically use water that is about the same temperature as the first pan. To the water in the third pan, add approximately 1 capful of chlorine bleach. This will sanitize the dishes and help prevent you from getting sick the next time you eat off of them. Immediately after you’ve prepared your meal start heating water for the three dishpan method of cleaning. Allow the water to heat while you enjoy eating your meal. After eating, scrape all food particles off of your plates, bowls, pots and pans. They should “look” clean before you start washing them. Dispose of the excess food properly (away from your campsite when camping, etc). Dip a dish in the first pan, using your hand to scrub it clean. Make sure to cover all surfaces of dish. Repeat as necessary to get the entire dish clean. Once the dish is clean, rinse it in the second pan to remove the soapy residue. After rinsing, submerge the dish in the third pan. Allow it to soak for approximately 2 minutes. This will allow the chlorine bleach to sanitize the dish and kill any microscopic organisms that may make you sick. After the dishes have been washed, the must be dried. It’s best to allow the dishes to air dry. Drying with a towel allows the possibility of recontaminating the dishes with potentially harmful bacteria. Air drying eliminates that possibility. To air dry, you can set the dishes on a sanitized surface and allow the moister to evaporate. Better yet, you can place them in a mesh bag and allow them to hang dry from a clothes line. The latter allows the gravity and evaporation to work together to dry the dishes. After all of your cooking utensils are clean, it’s time to clean the dish washing stations. Clean them in the same order that you used to wash your dishes. Pour the soapy water out of the first pan. Take care to dispose if it properly. At home, you can pour it down the drain. When camping, make sure you pour it out away from your campsite and at least 100 feet from a stream or other water source. Next pour the rinse water from the second pan into the first to remove the soapy water from the first pan. Finally, use the sanitized water from the third pan to sanitize the first two pans. Have do you clean dishes when the power is out? Today I bring you a fantastic article from Andrew Baze on the topic of Ham Radio. You might remember Andrew as the author of ‘The Road Home’ that I reviewed a few weeks ago. Be sure to go check out Andrew’s blog “Emergency Communications” and read his stuff. Well worth the time! Amateur radio is an incredibly flexible and powerful communication option, especially in an emergency, and it’s probably easier to learn about and get involved with than you think. In this and the next two articles, I’ll walk you through the basics, and show you the simple steps you can take to add a very useful tool to your preparedness toolbox. It’s easy, interesting, and if you want to be realistically prepared to take care of yourself and your family, you’ll need this information! I’ve been actively involved in my local ARES (Amateur Radio Emergency Services) team for the City of Redmond, talking to friends on the radio, experimenting with digital modes, NVIS (more on that in article #3), satellite communications, and more. It’s been enjoyable and educational. And there’s one very interesting thing I’ve learned during this process, which will benefit you directly. Much of the learning material out there doesn’t make it easy! This case will be different, however. My goal is to make some of these concepts much easier for you to understand. I’m going to explain things not in the manner of an electrical engineer, but like a regular guy would. Here goes. In this article, we’ll start with the basics, and give you some ideas for getting more information. 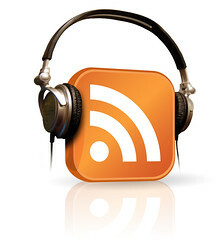 In subsequent articles, we’ll talk about specific equipment, technologies, frequencies, some interesting information on what’s really allowed during an emergency, and more. Let’s start with “What is ham radio?” It’s the term used to refer to amateur radio, a fun hobby for many. But why “ham”? Some people speculate that it’s because certain people involved in amateur radio back in the old days really loved to talk, and would “ham it up”, telling long stories to their buddies when they’d get together on the airwaves to chat. The Federal Communications Commission (FCC) has set aside certain frequencies for people to use for non-business-related communication. To use a radio that works on amateur radio frequencies, you need to take a simple test and get a license. The first license, called “Technician”, is not difficult to get, and there are a many books, CDs, and websites (with free sample tests) available to walk you through the questions and answers. Once you’ve reviewed the material and feel comfortable, you can take a test and get your own license. (Subliminal suggestion: Do it. It’s easy.) Many ham radio clubs administer the tests, and will be happy to help you with the simple paperwork at the same time. Soon after, you’ll get your call sign from the FCC, and you can get on the air! 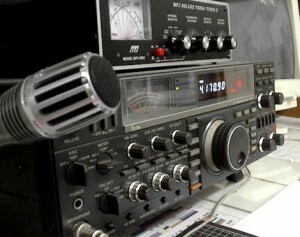 These links will provide some additional, general information about ham radio: http://www.arrl.org/what-is-ham-radio-1, http://en.wikipedia.org/wiki/Amateur_radio. Why does ham radio matter? It doesn’t take a lot of imagination to come up with a scenario where cell phones don’t work. You’ve probably been out of range of a cell tower at some point, and wanted to make a call. But imagine if there was no coverage, no matter where you went…And a phone call could mean life or death. By using a mobile radio (in a vehicle) or base station radio (usually on a desk), along with an appropriate antenna, a ham radio operator can communicate across great distances, even across continents and oceans. Here’s an interesting example: I listened to a ham radio operator as he transmitted and then moments later received his own transmission after it bounced its way through the atmosphere, all the way around the earth! What can you do right now to get started? In the next two articles, we’ll talk about UHF & VHF radio (often used for local communications), HF radio (which can be used for local/regional as well as long-distance communications), different things you can do with your radio, antennas, and more. In the meantime, if you’re interested in learning more, do an Internet search for local ham clubs and ARES/RACES groups in your area, and contact them. You can probably find people in your area who would love to talk about what they do. All you have to do is ask! More information is on the way soon. In Part 1 I discussed the availability of Vet Antibiotics on Amazon.com and also presented a recommended “shopping list”. In this segment a source for “meant for human consumption” antibiotics is considered. I have been unable to find what I would be considered absolute factual information that leads me to believe that antibiotics meant for animal/fish use are EXACTLY the same as those prescribed for humans. With that said – I personally would not hesitate to use vet antibiotics if it was necessary. Some people would. I had a loyal reader whose opinion I value greatly contact me and recommend the website SurvivingHealthy.com . SurvivingHealthy.com offers services and products related to legally obtaining antibiotics meant for humans. SurvivingHealthy.com offers several “antibiotic survival packs” legally. How is this done? A real doctor reviews your medical history and prescribes the antibiotics for you. The medication is shipped directly to your door along with information on dosage and when to use. I contacted Dr. Bob at SurvivingHealthy.com and told him that I was writing this post – and was going to be comparing the options of obtaining vet antibiotics versus human. I asked for his opinion. Dr. Bob responded quickly and stated that he believes there are some advantages to using the services which SurvivingHealthy provides – such as reliability, cost, and information. He did not really have any comments regarding whether vet antibiotics were safe to consume – however he did state that all med’s obtained through his services were FDA approved. The “information” part of the service which SurvivingHealthy.com offers is extremely important to me. Dr. bob stated that he “put together an entire guideline for use with our meds, with the TEOTWAWKI recommendations included for real post-world use.” To me – this is excellent as I am not a doctor or have any knowledge of what antibiotics to take for what situations and in what amounts. Basic – Includes complete treatment for multiple infections with complete instructions included. Antibiotics included: penicillin, amoxicillin, doxycycline, cephalexin, sulfa. Deluxe – Includes complete treatment for multiple infections with complete instructions included. Includes basic pack PLUS amoxicillin/clavulanate (generic Augmentin), azithromycin (generic Zithromax), and levofloxacin (generic Levaquin) ONLY FOR THOSE WITH NO ANTIBIOTIC ALLERGIES! Regardless of one’s own belief concerning the ability to safely consume vet antibiotics - SurvivingHealthy.com certainly provides a best-case option for obtaining FDA approved “meant for human consumption” antibiotics. There are other services and sources for human-use antibiotics – however SurvivingHealthy.com is one which I am most familiar. More to come in Part 3. When is ice safe? There really is no sure answer. Ice should never be considered safe. You can’t judge the strength of ice just by its appearance, age, thickness, temperature, or whether or not the ice is covered with snow. Strength is based on all these factors — plus the depth of water under the ice, size of the water body, water chemistry and currents, the distribution of the load on the ice, and local climatic conditions. New ice is usually stronger than old ice. Four inches of clear, newly‑formed ice may support one person on foot, while a foot or more of old, partially‑thawed ice may not. Ice seldom freezes uniformly. It may be a foot thick in one location and only an inch or two just a few feet away. Ice formed over flowing water and currents is often dangerous. This is especially true near streams, bridges and culverts. Also, the ice on outside river bends is usually weaker due to the undermining effects of the faster current. The insulating effect of snow slows down the freezing process. The extra weight also reduces how much weight the ice sheet can support. Also, ice near shore can be weaker than ice that is farther out. Booming and cracking ice isn’t necessarily dangerous. It only means that the ice is expanding and contracting as the temperature changes. Schools of fish or flocks of waterfowl can also adversely affect the relative safety of ice. The movement of fish can bring warm water up from the bottom of the lake. In the past, this has opened holes in the ice causing snowmobiles and cars to break through. White ice, sometimes called “snow ice,” is only about one-half as strong as new clear ice so the above thicknesses should be doubled. How to check the ice thickness? One way is to use a cordless drill with a 5/8 inch wood auger bit. It won’t take long to drill through the ice to check the depth. Use a tape measure. Other things to keep in mind when checking ice. Ice is seldom the same thickness over a single body of water. It can be two feet thick in one place and one inch thick a few yards away due to currents, springs, rotting vegetation or school of rough fish. Vehicles weighing about one ton such as cars, pickups or SUVs should be parked at least 50 feet apart and moved every two hours to prevent sinking. It’s not a bad idea to make a hole next to the car. If water starts to overflow the top of the hole, the ice is sinking and it’s time to move the vehicle! Survival Preparedness for a Broke College Grad? Moving is really on my mind because I'm moving in 10 days. What am I forgetting? Oh yeah, I still have to PACK!!! Packing aside, a recent concern of mine is OPSEC. As economic issues in the world seem to be coming to a head, I wonder if the time is near when my preps will become a necessity instead of an eccentricity. I don't want to compromise my supplies by allowing them to become public knowledge. I'm using a moving company this time around. This brings a new concern to the table. If they are hauling hampers full of canned goods and going into my storage room to lug boxes, what are the chances they are going to remember that room when there is no food to be found? Moving hundreds of pounds of canned foods is bound to make an impression! However, I have an evil plan. Using my love for hiding things in plain sight, I'm going to box up my food stores and mark them in secret code. Shhh....I'll let you use my secret decoder ring! In fact, I liked this idea so much, I decided to incorporate it into OPSEC for the new house! Imagine you have a repairman poking around the basement to fix your furnace. Is he going to give a second glance to box after box of baby stuff and holiday decorations? Besides my supply of food, I have enough water stored to last us for a month. For those of you doing the math, that is 110 gallons of water. 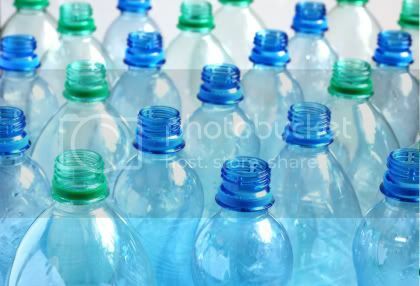 Divide that into 2 litre bottles and you have...................190 two litre bottles and 6 five gallon jugs. LOTSA WATER!!! Clearly, I'm not paying someone to lug all that water over there. I feel terrible about dumping it, but I'm going to empty my 2 liter bottles into the tub and throw them into a big garbage bag. Okay, a few big garbage bags. Once we get moved and everyone is gone, I will refill them again. I'm going to put them one deep at the back of the storage shelves and put boxes in front of them. It took so long to collect that many bottles, I don't want to start all over again despite the fact that I really love Diet Coke. Other prepping items are less likely to draw attention. Camping supplies are simply camping supplies, candles will be in a box and so will extra batteries, etc. I'm not too concerned that somebody will covet my 27 bottles of shampoo or my 60 bars of Ivory soap. Have you ever had to move your preps? What did you do to camouflage your supplies? Do you do anything to disguise your storage in your home? Although we all dream of a lovely cabin in the remote Northern woods, tucked in beside a bubbling stream and surrounded by trees as far as the eye can see, this isn't realistic for most of us. One of my pet prepping topics is "bugging in." For those of us without the resources to pick up and move full time to our retreat, that can be the best option in many scenarios. As a single mama with two lovely teenage daughters, the last thing in the world I plan to do is take off on foot to destinations unknown with the rest of the golden horde. We plan to hunker down and hide out in plain sight. We live in a city of around 100,000 people in Southern Ontario. While that is not ideal in terms of population, it's what we have to work with. So the question is, with weapons strictly monitored in Canada, how do you make your house the least inviting one on the block? 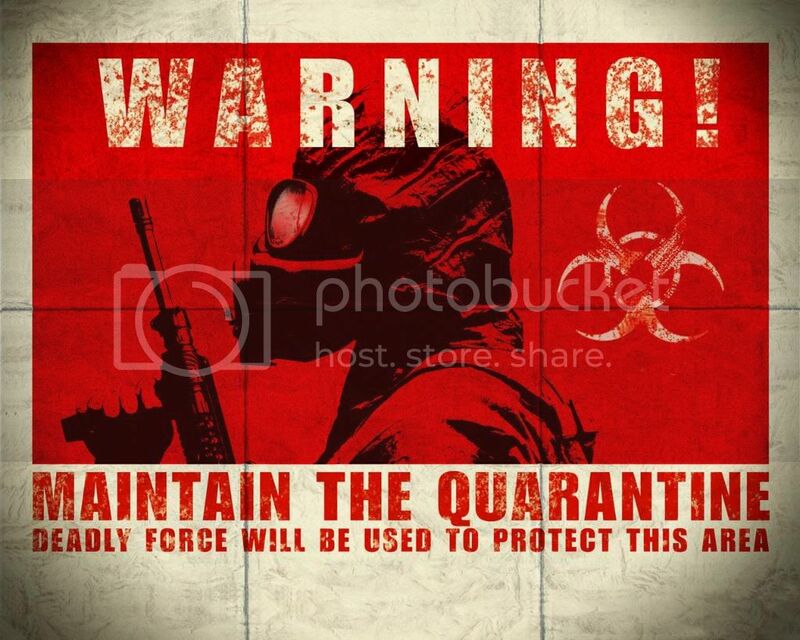 Take a moment to consider the humble "Quarantine" sign. How can a simple typed piece of paper strike fear into the heart of the most hardened and well-armed criminal? Just invoke the power of a deadly virus. 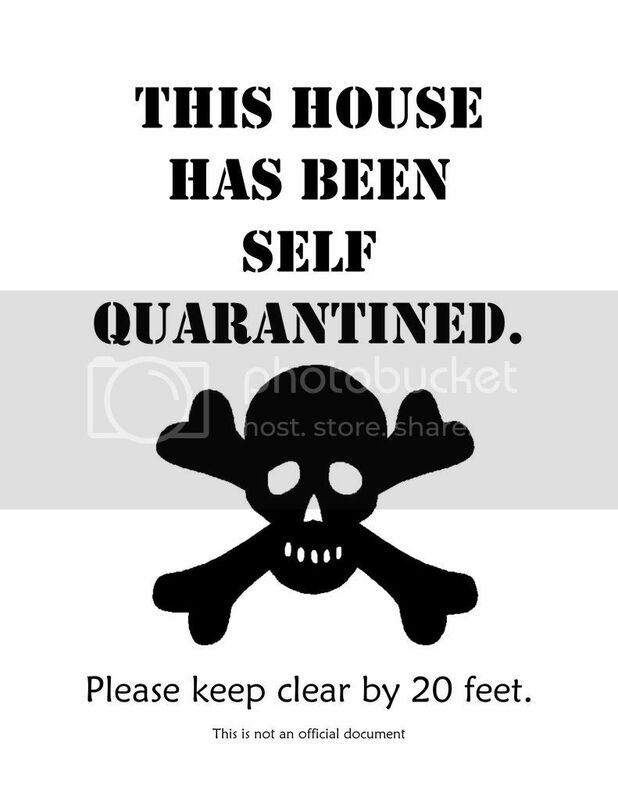 Very few people could want what the house contains enough to enter a place that is restricted due to quarantine. For all intents and purposes, my home could be host to H1N1, cholera, dysentery, measles, smallpox or even a biological contagion like Anthrax. I've included some photos that I found on the internet but feel free to do your own Google search. I've printed off a number of different signs and have them filed neatly away in my office. It's important to use something that is realistic to the crisis at hand. If sanitation or flooding is an issue, water-borne illnesses like Cholera are realistic. During a pandemic, go with the disease at hand. During times of civil unrest a biological contaminant is far more likely, including radiation, small pox or anthrax. I have signs related to specific issues and simple generic"Contagious Disease Present" signs. 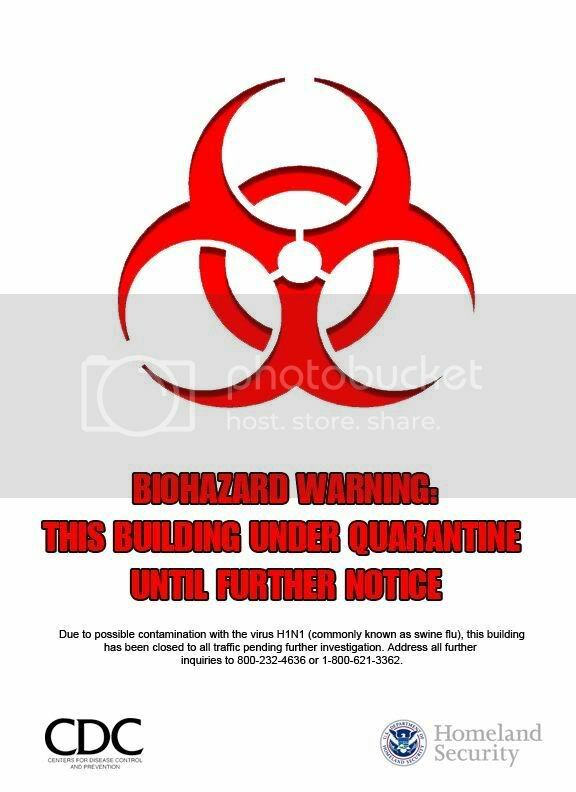 I have signs with the Ministry of Health insignia, the CDC logo and the FEMA seal, ready to be affixed to all of the entrances to the house. Keep your curtains drawn and black out your windows with heavy plastic to keep curious eyes from looking in and seeing you and your family looking perfectly healthy. FEMA condemnation signs are usually printed on red paper. Police tape (easily acquired at Halloween) is a nice touch. FEMA also spray paints symbols on houses during searches to warn people to stay away. Keep your family members indoors and lay low until the situation improves. What horrible diseases sound realistic to you? Do you have other strategies for making your home undesirable to criminals if the SHTF? Are there some diseases that you feel people would risk to access your home and possibly find provisions? Remember, the fight that you avoid is the fight that you win. Use this link to support the DailySurvival Blog? Thank you for your donation, mick66! Henry U.S. Survival Rifle 22LR Semi-Auto AR-7 ?